Time 15.26 CST. The building shook. We live almost 30km outside Oslo. I opened my office door and shouted, "Did you feel that?" It was like a big explosion. Now on the News - a big explosion in the Government quarters in Oslo City. Windows are blown out of the building. Dead and injured reported. The prime minister is reported safe. More later. Note the Ascendant in the event chart against the ascendant of the national chart. Mars in the national chart rising. The degree was transited by Uranus in the North Sea Bravo Blow-Out, April 22. 1977. Notice that Uranus in the event chart is semi-sextile [text corrected from 'square'] Venus, ruler of the 10th of the Government, in the national chart. Mercury culminating in the south in both charts. Fixed square. Reports are that it was a car bomb and could be the largest act of terror on Norwegian earth in modern time. Sun rules 10th (Government) - it is partile conjunct Uranus (shocking developments, violence) in 5th, a degree after the IC (would be quadrant 4th house - the homeland). Moon's configuration is separating from Saturn/Libra/12th (secret enemies) and applying to Mercury/Aries/6th - Mercury rules MC and 8th. Accidental rulers of death and destruction are Mercury and Jupiter (8th and 8th from Fortune rulers respectively) and they are in Aries (violent sign), Moon applying to Mercury - although it appears the large explosion targeting the government district did not cause many fatalities, mostly injuries (6th). Mars/Pisces is in the same sign as the IC giving it some 4th house significations. Angles the same, now Asc ruler Mars is in the 8th with Venus (12th and 7th ruler), Moon (The people/public sentiment) is in the 8th from fortune (Death), Sun (10th ruler) applies to Jupiter, 8th from Fortune ruler. Are you an astrologer or a medium !! I guess you are pointing out that Aries ingress, Cancer ingress for Oslo are all in Scorpio ascendant and Algol on th 7th cusp. The event cahrt has scorpio risnig as well with Mars in 8th conj South Node. Was the analysis of "fear of flying" horary a premonition horary ? When added to #Ura sq #Plu and with #Nep#Pis recently going retro and its not good. #Nep retrograde is weak and with the tight conj to the IC it points to religious reasons for the explosion and general dissatisfaction. #Jup on DC isnt good its in debility and on a sabian 'a sleigh without snow' meaning frustration and anger at lack of progress. #Nep weak gives the sabian symbol interpretation by ME Jones as .. The social nature of human responsibilities. A last-moment,joyous rallying to a task. Negatively described as " A Complete Insensibility to Any Over-all Welfare"
North West of Oslo. Several youths are to have been shot and killed! This is a critical day in modern Norwegian history! There is no overview on what is going on at the moment. The Head-quarters on Norways leading newspapers, Aftenposten and VG, are being evacuated and relocated to new locations. Police are advising people to leave Oslo Centrum. Sadalmelek IC(LCul, 0�36',cp), The Lucky one of the King, making ones own luck. The power of networking. The leader fails, The king is dead. Mercury Ras Algethi (Set-Cul, 0�12',cp) A pressure point is released. Neptune Polaris (Set-Cul, 0�07'), A final solution presented, or last chance that fails. Pluto Murzim (LCul-Cul, 0�07',alh) The words of one person, or a seemingly small event, have very powerful consequences. The swing of the pendulum, the people are out of balance. Venus Aldebaran (Set-LCul, 0�13')A time of community awareness and Environmental issues. Pluto Murzims (Cul-LCul, 0�06',alh) The words of one person, or a seemingly small event have powerful consequences. Four people shot at the Labour Party Youth Summer Camp. 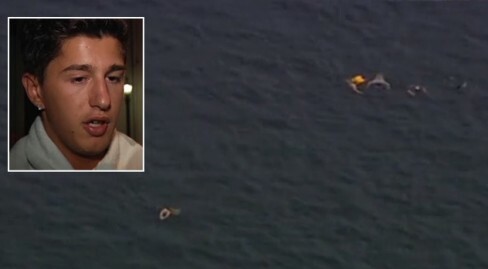 People were reported in the water swimming for their lives. Transit Pluto is conjunct natal Saturn. 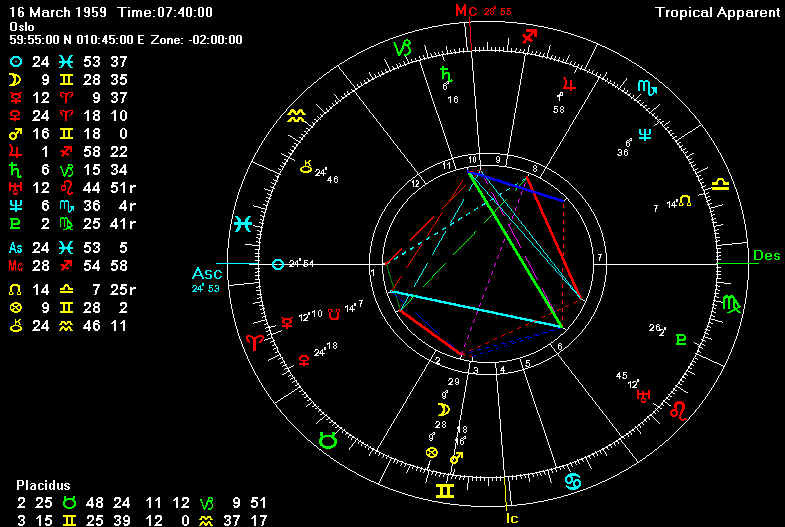 Transit Mars is applying to square his natal Sun. The event has certainly shocked the world. When I woke up at 6:00 a.m here in Australia it was the only story on the TV news. I have only met 1 Norwegian person. She lived through Nazi occupation in Norway. What a tragedy. The death toll is sure to rise in both places. The rest of the world feels for Norway. The police have arrested the 32 year old, Norwegian, right wing extremist, Anders Behring Breivik, born Feb 13. 1979, suspected for both attacks. He portended to be a policeman and asked to be transported to the Utoya island by the youths by boat, as a part of a security precaution, where he then attempted to attract the youths to him and started to shoot them cold handed one by one. 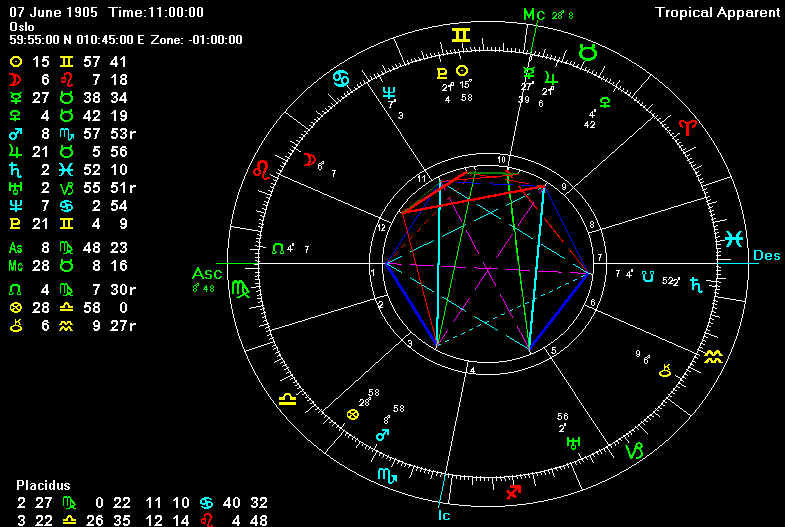 Breivik has Sun 24 Aquarius conjunct Mercury, Moon Virgo conjunct Saturn at 12 Virgo. Mars is in the degrees of the nodes at 19 Aquarius and square Uranus 21 Scorpio, violent signs. He is supposively a Conservative Christian. Jupiter and Neptune angular in the event chart. 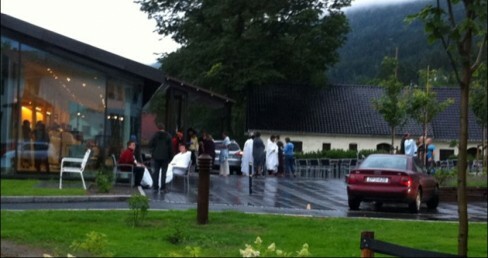 Over 80 people hve been reported shot and killed on Utoya at the Labour Party Youth Summer gathering. Oh, this is too terrible!! The horror of what the man did at the camp is absolutely .... I have no words. Transiting Mars Opposing Neptune - passion that is against idealogy? okay just some passing thoughts, on this insane act. Mars is getting close to the degree of the June 15 eclipse in Gemini. Two events. Just a thought. The attacker also owned a farm where he was growing vegetables. It is speculated that he built the car bomb from industrial manufactured fertilizer. That probably means it is chemically based. Jupiter in Taurus on the descendant of the event chart, Neptune in Pisces on the cusp of the 4th. Norway is ruled by Scorpio. Mars in the degree of the Moon's South node may be a co-significator of national vulnerability. The fear, flight and slaughtering of the youths participating at a peaceful camp on an island in the middle of nowhere is unbeliveble. 91 people are now reported dead. Images from: VG. The explosion in Oslo Centrum occurred only 100-200metres from where the Norwegian Astrological Association hold their bi-weekly meetings. The Ut�ya Island is just up at a place called Sundvollen, which is were the Norwegian used to hold their annual conferences. Many international speakers visiting Norway will be familiar with the locations. The Sundvollen hotel was used as base for survivors and their families. Where are all the malevolent and violent fixed stars we would expect for such an event? Tom and other trad.astrologers must be scratching their heads at this time..even the dull light of the "dreaded" Alzirr has failed to shed light on proceedings. Take my advice and use sabian symbols instead. Everything old is not necessarily best - look at bear-baiting, cockfighting etc. Away from ancient obfuscation and onto the role of the outer planets..
Where is the Extreme Right in all this? #Ura sq #Plu is the most important planetary cycle here, the last time Uranus and Pluto were in square aspect together was during the 1930's - and we all know what happened then - the rise of the Nazi Party. So maybe we should have been quicker to predict something like this happening. With #Plu in the 2nd house of posessions..we are probably looking at a material factor in all this. Apparently the gunman's businesses had failed in the past and this seems to be one trigger for his frustration and anger. Then we have #Jup on cusp of 7th (enemies). Jupiter is the planet of liberalism and multiculturism...when its exactly on top of the cusp it is particularly powerful..he saw liberalism as an enemy of the country and his more old fashioned traditional #Plu#Cap values. Jupiter ofcourse is trine the afflicted Pluto. And yes Pluto is indeed a planet - what further proof could you possibly need!